A wild Adventure Down Under. Warrior Echidnas, threatening Thylacines and curious Kowaries are just the beginning of this amazing tale of fantasy and adventure in a unique wilderness that spreads across the deserts and forests of the top end of Australia. 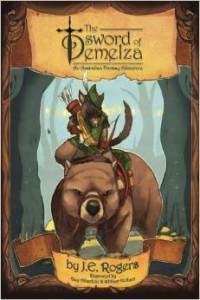 The Sword of Demelza by J.E. Rogers has taken many of our endangered animals and magnificently brought them to life with human like caricatures. Many of the smaller creatures live in homes inside trees with little dining settings where they serve tea with berries and cream. Quite a quaint idea that could have almost been idyllic were it not for the trouble about to unfold as the evil fox that ruled over the countryside set his terrible dragon lizards to destroy the peaceful villages. Because I, like many indie authors, need book reviews to prosper, it’s crossed my mind to wonder why so few readers write them. There are lots of theories. 1.Readers are lazy and/or can’t be bothered to take the time. They read books, toss them aside, and move on. 2. Readers don’t think their opinion matters; the pros do the reviewing, and no one cares what anyone else thinks. 3. Readers aren’t sure what to put into a review. As for #1, there’s nothing I can do except implore you to reconsider. When you like a book, the only way other people get to share your joy is if you tell them about it. Likewise, when you hate a book, you can help others avoid inflicting the pain on themselves. Today’s blog post is very special. This isn’t just because I am posting on a Sunday. It is also because a very special guest is here today. Meet Oreo. 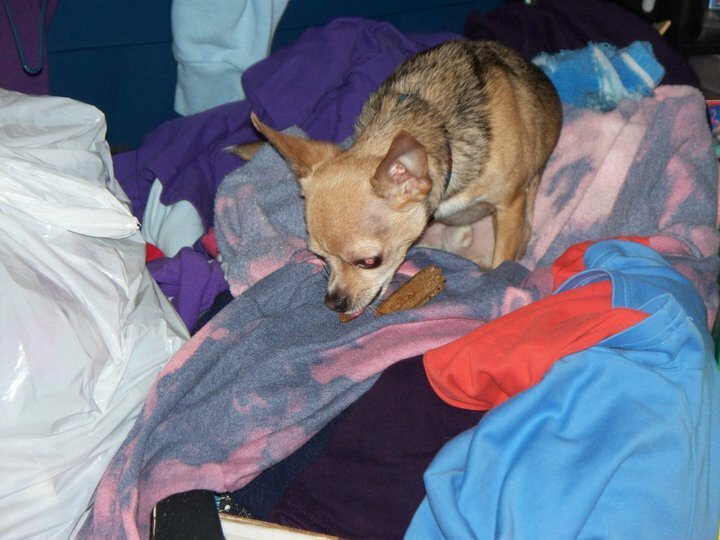 This cute little dog is the mascot of the Read for Animals project, but what is this project? 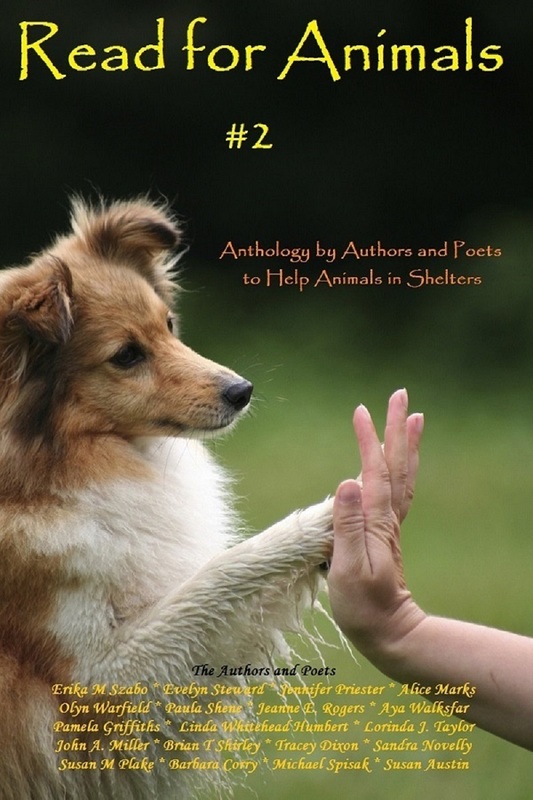 The second Read for Animals Anthology was recently released. My previous blog post was about this book and the two stories I wrote for it. Both books can be found for purchase in both print and eBook formats. The following link will take you to the page where you can find links to buy, watch the rise of the Raise a Paw meter, enter a giveaway to win a full color print of Book Two, vote for the next shelter, sanctuary or animal hospice to receive the donation of $100, discover other books to read and more: http://www.authorerikamszabo.com/read-for-animals.html. Although this meter looks different from the one on the site, it shows you how the Raise a Paw meter works. 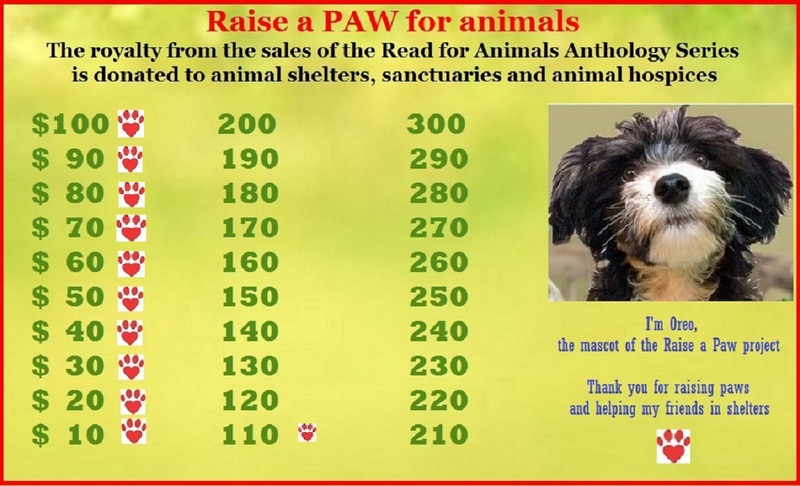 Basically for each $10 made a paw gets added to the meter indicating what the profit level is currently at and what number we are working towards achieving. The ultimate goal is to reach for the hundreds as each time another $100 is raised the money goes directly to animals in need. Besides helping Oreo raise a paw for animals by buying the anthologies and spreading the word about them to friends and family, there is another way you can help. At this time Oreo is on a quest to visit as many blogs, websites, Facebook and other social media sites as he can to talk about the Read for Animals project. Would you invite him to visit yours or would you say no to this adorable little dog that wants to help his animal friends in the shelters? 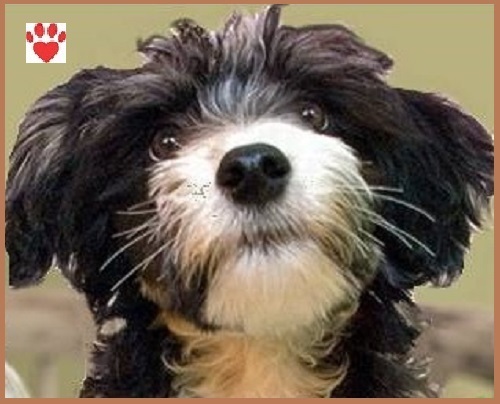 If you would like to invite Oreo head over to this site and tell him: http://www.authorerikamszabo.com/raise-a-paw.html. Looking through books I have read I noticed that several of them are parts of historical fiction series for children. Previously I thought I didn’t like historical fiction so I was a bit surprised by this. Due to the fact that I read several and enjoyed most of the ones I read I decided to compare these books. The following books have been compared not just by the storyline and my enjoyment of it, but my ability to remember the facts presented as well. Horse Diaries: Each book in this series was written by a different author and is told by the horse. I found this series to have some interesting and entertaining stories that ranged from good to excellent. They all read well in the sense that unless you recognized the facts and the books didn’t say, you wouldn’t know that the stories were based off of real horses and true events, however I didn’t retain many of these facts. 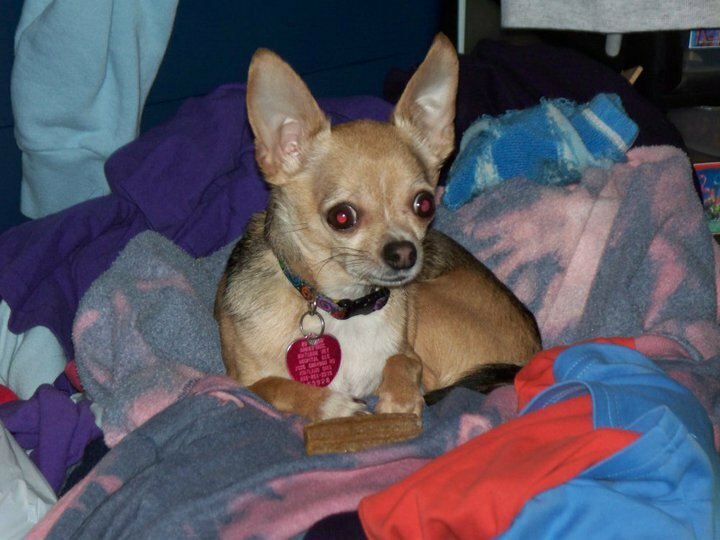 Dog Diaries: Each book in this series was written by Kate Klimo. This series looks and reads much like the Horse Diaries series, however the facts are more obvious particularly because the famous dogs, such as Barry and Togo, tell you right in the first chapter that they were real dogs and all the events in the book actually happened. This makes it harder to ignore the fact that the books are historical fiction so while I liked the stories and reading about the dogs, my disinterest in history often got in the way. However, unlike the Horse Diaries series I retained most of the facts. Maximilian P. Mouse, Time Traveler: Each book in this series was written by Philip M. Horender. I have only read a couple of these books and while I found them to be good I haven’t really gotten that into them. So far I have only gotten into them enough to continue to read the series. I found fact retention happened on and off with these books. Blast to the Past: Each book in this series was written by Stacia Deutsch. I found these to be great stories. The books are all told in a way that lets the reader know the facts are true without managing to sound like a textbook or nonfiction. I found I retained many of the facts from this series. Time Warp Trio: Each book in this series was written by Jon Scieszka. I found this series to be full of good stories and good facts but didn’t find myself retaining many of them. I have always read books about animals. There was a time when I thought I wanted to be a vet. Due to this I read many book series related to this subject so I thought I would compare eight of these series. For this post I judged each series by it’s storyline, how realistically it portrayed the veterinary world, and how well I remembered the animal facts presented. Animal Ark: Each book in this series that was released in the U.S. was written under the name of Ben M. Baglio. However the books were originally written under the author’s real name of Lucy Daniels and many of the books were not released under her pseudonym. 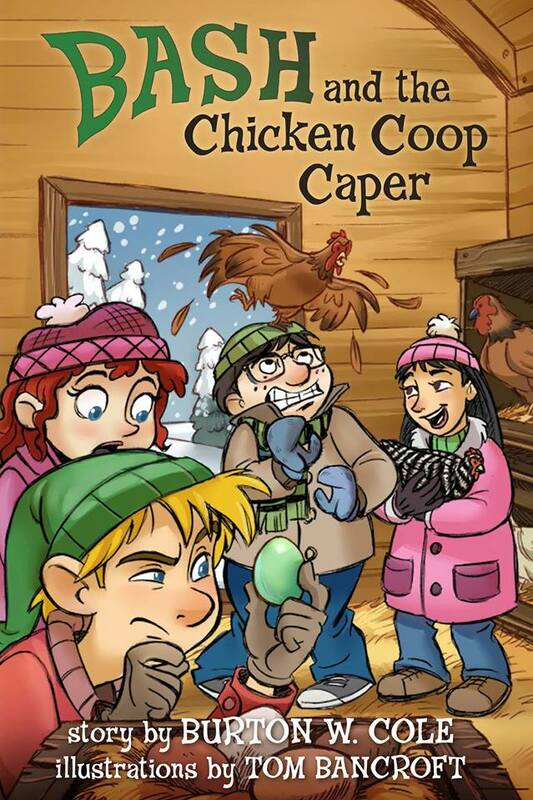 I always found the books in this series to contain enjoyable stories and facts. Throughout my many years of reading the books I know I learned many animal facts and the series fairly realistically portrays life as a country vet. Animal Inn: Each book in this series was written by Virginia Vail. The books are similar to the Animal Ark series though it didn’t always focus as much on the veterinary world as Animal Ark. Animal Emergency: Each book in this series was written by Emily Costello. I definitely felt that much of the veterinary world was realistically captured and the stories have all been very enjoyable. Vet Volunteers (Wild at Heart): These books have two different series names. Vet Volunteers is the one the eBooks are listed under but you can find them in print under both names. Each book in this series was written by Laurie Halse Anderson. This series is very realistic the stories are very enjoyable. The animal facts are also very interesting. Pet Vet: These books were written by Darrel & Sally Odgers. 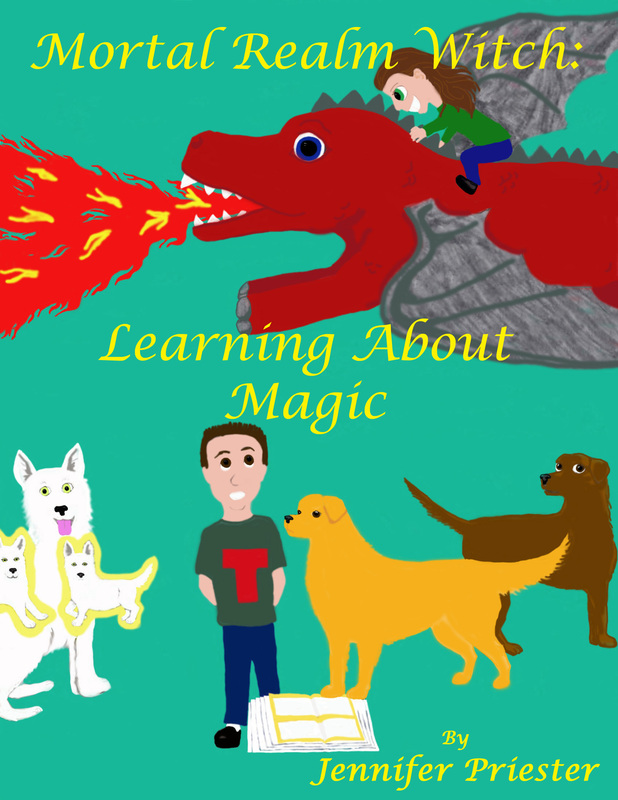 It’s realistic enough but having been written for a very young reading level, doesn’t focus much on the veterinary side or have a lot of animal facts. Animal Ark Hauntings: (See Animal Ark) Really no different from Animal Ark except all the animals are ghosts being ghosts means they don’t need veterinary treatment so while I love the stories it’s not as full of facts as the other series. Animal Ark Pets: (See Animal Ark) These books were written for a younger level and while there are some good facts and the storylines are good, there aren’t really many vet related ones. Little Animal Ark (See Animal Ark) As they were written for an even younger level than Animal Ark Pets these books really don’t contain any facts but are good stories. Because the books are so close in this I was only able to put them into two groups, rather than rate each individually. Animal Ark, Animal Inn, Animal Emergency, and Vet Volunteers earned a place in group one and Pet Vet, Animal Ark Hauntings, Animal Ark Pets, and Little Animal Ark got group two. Group one is the winning group but I don’t feel any of the four books in this group really rise above the rest. The clear winner here is the Vet Volunteers series. Now, one vet series I haven’t mentioned that I really like is The Imaginary Veterinary by Suzanne Selfors. The reason I didn’t mention it was because, while the books are really fun to read and based around a veterinary clinic, they focus on animals and creatures that don’t exist in the real world. I am mentioning it now because it is a fictional vet series and I love the imagination involved in it. I really enjoyed this book. If I could give half stars I would have given it four and a half instead of just four stars. Anyway I found the story to be very fast paced and the characters enjoyable. I especially loved that the giants were friendly. Before this the only book I had ever read with a friendly giant in it was The BFG. Giants, especially friendly, don’t tend to be chosen too often to be main characters in books so this book also felt very unique to me. The only thing I didn’t like about the book, though I understood the reasons for it, was the fact that magic is banned in the land of the giants. Until that revelation I thought that living among the giants sounded like a lot of fun. The giants under Cheetaka’s rule obviously enjoy an overall peaceful existence and I really love the queen’s rule regarding the wild animals, but I know I would never enjoy living in a fantasy world where I couldn’t have magical powers. While I received an advanced copy of this book to review, it didn’t affect my chosen rating or review in any way. This was also the first book I had ever read of this author’s and I am definitely going to be reading more of them. 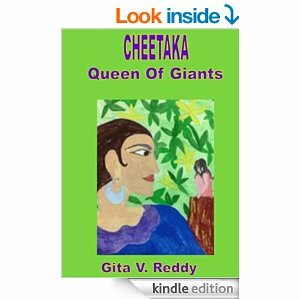 Cheetaka, Queen of Giants can be found and purchased as an eBook from Amazon, https://animalsandmagic.wordpress.com/wp-admin/post.php?post=698&action=edit, Smashwords, or iTunes. “Rita Lee Chapman was born in the UK and migrated to Australia in her early twenties. It was only when she retired that she wrote her first novel Missing in Egypt a romantic travel mystery. Her second book Winston – a Horse’s Tale is for horse lovers from teenagers upwards. Told by Winston himself it relates his life experiences in Australia, as well as those of other horses he meets along the way. Rita enjoys playing tennis, reading, swimming, walking and the theatre. Now it’s my turn to post. The name of the character I am posting about today is Asantra. Though she might argue otherwise, Asantra is fictional. The story is set in present day and takes place in two places, the Other Realm and the Mortal Realm. Asantra is basically a good hearted witch and human-wolf shape shifter who is just beginning to learn about mortals and their realm. Asantra is highly adventurous, a bit stubborn and can be short tempered. These qualities often lead her into trouble. Asantra’s problems really begin with a bad experience in the Mortal Realm that leaves her believing that she hates mortals when one she thought was a friend acts very differently towards her upon discovering she is a witch. Previously Asantra had really enjoyed her adventures in the Mortal Realm but after this experience she comes to believe that this is the way all mortals probably are. Things are only made worse when Asantra comes to the age when it’s time for her to live in and go to school in the Mortal Realm as she brings her attitude towards mortals with her and has a hard time getting along with them. Asantra really doesn’t have any personal goals at this point in time. She isn’t a very goal oriented type of person. Her main goal is just to have fun, though for a while Asantra’s goal seems to be to disprove her mom’s theory that witches and mortals can live together peacefully. 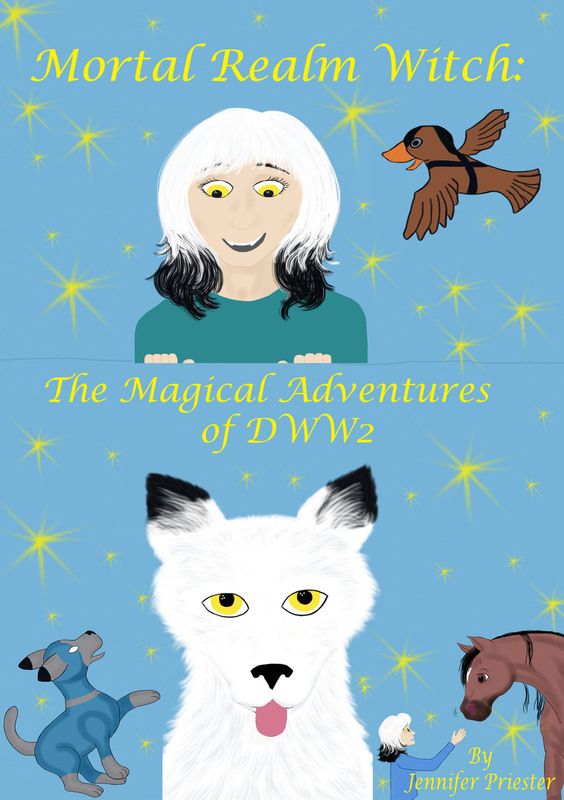 The title of this book will be Mortal Realm Witch: The Magical Adventures of DWW2. If you would like to find out more about it you can do so by visiting the Mortal Realm Witch Series website at http://www.mortalrealmwitch.com. Besides learning about the book you can meet Asantra and the other characters in the Meet the Characters section of the site and find a link to some character interviews, as well as read a story featuring her in the Extra’s section. You can also discover more about Asantra and the other characters by visiting my Goodreads group: Character Chat: https://www.goodreads.com/group/show/113088-character-chat. I am expecting to publish this one sometime in 2015, though there is always a small chance it could be released near the end of 2014. In the meantime anyone interested in discovering the stories before Asantra’s appearance can read any of the currently released books in the Mortal Realm Witch Series which include; Book One, Mortal Realm Witch: Learning About Magic, which features Asantra’s mom as a young witch who is just learning how to use her newly discovered magical powers and learn responsibility in the process, and Book Two, Mortal Realm Witch: The Magic Continues, which feature the continuing adventures of DWW. 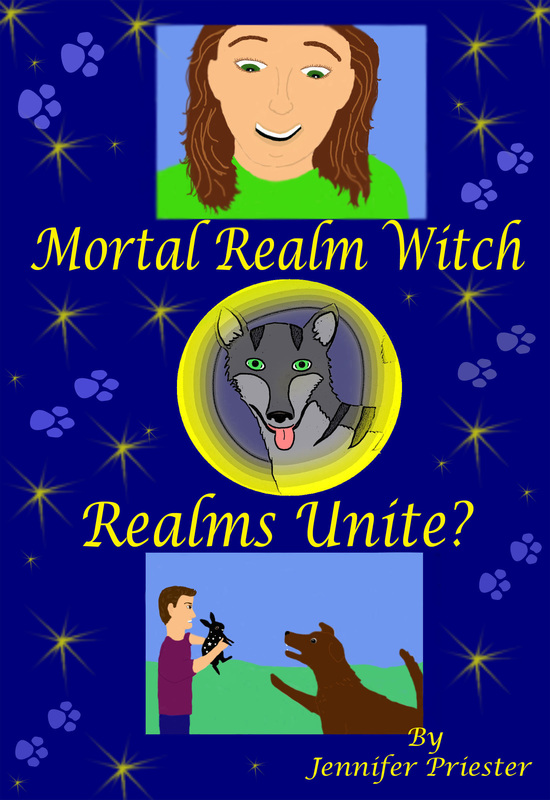 Book Three, Mortal Realm Witch: Realms Unite? and Tales of Familiars: The First Mortal Realm Witch Series Companion are due out this month so there is plenty of reading you can do prior to meeting Asantra if you desire to do so. Or if Asantra’s the only character you currently have interest in then you are in luck as each book in the Series can be read individually and you will still get a full story. However you won’t get to see the progress of the characters or main series storyline as easily. 1) You will answer the same 7 questions I did in this post. 2) You will be required to post 1 week after I did which would be July 14th. 3) As seen in the beginning of my post, you will need to include a short bio of the person who tagged you as well as a link back to their blog. You will also want to include an explanation of the tour as I did at top. 4) At the end of your post if you managed to tag other authors you would add their bio and link at this point. Since I couldn’t get anyone I wasn’t able to do this. 5) This should actually be before #4, but if you accept my tag, you will than attempt to tag up to five other authors and give them the rules of this tour. They will have to post one week after you do so if you accept my tag and post on the 14th, then the authors you tag will post on the 21st. Will you consider yourself tagged and continue this tour? Recently I began working on the last stories that will be part of the Mortal Realm Witch series. The series will have six books as part of the main series storyline as well as two companions and a guidebook. 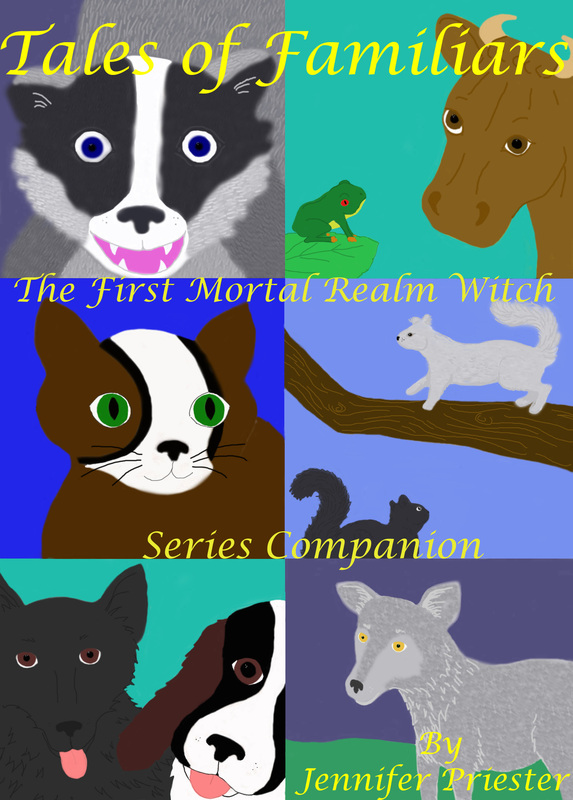 While only the first two books, Mortal Realm Witch: Learning About Magic, and Mortal Realm Witch: The Magic Continues, are out now, the next two, Tales of Familiars: The First Mortal Realm Witch Series Companion, and Mortal Realm Witch: Realms Unite? are due out by this summer. With half of the series almost out I really began thinking about what’s next. I currently have many books in the works. Mortal Realm Witch: Realms Unite? 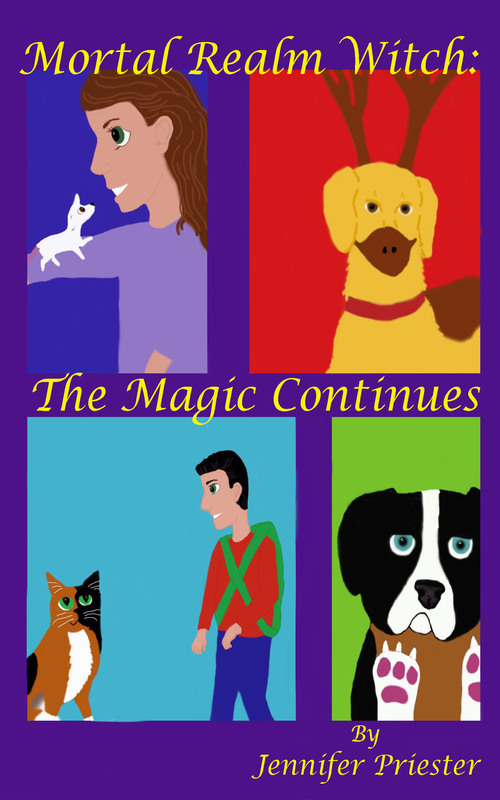 features the characters from The Young Animals Psychics-one of the books I am currently working on. It would be easy to say this book should be published next. However, Book Four, Mortal Realm Witch: The Magical Adventures of DWW2 features some of the characters from yet another of my works in progress-Heroes United. While both of the above mentioned books would be good releases since my readers will have already met many of the characters, it would also be nice to have more of a variety of books for a wider range of readers. At this time I have decided to run a poll, which will be open for voting for a week, featuring every book I have that is far enough progressed to be considered for publication after I release the final Mortal Realm Witch book. This poll does not include every book I am working on so if one of my other books interest you more than the ones in the poll you can add it either to the poll or in the comments. While the books I have listed in this poll are the ones that will be published first, this will help determine the order I work on and release the other books. 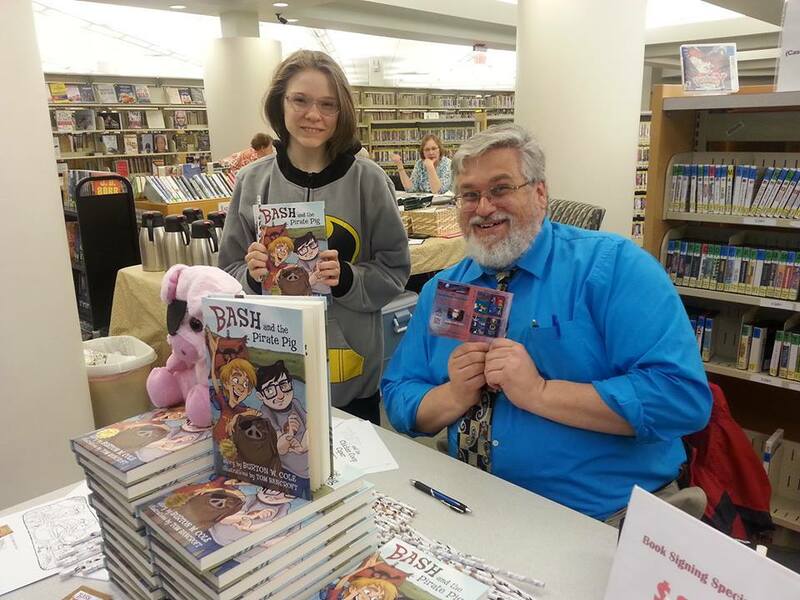 As those of you who saw my previous post know, I attended this years Books & Cooks event at Madison Library as one of the authors. The event itself was pretty good and I recommend going in a following year if you ever get a chance. During the event I had a small table and display. This is actually not the smallest space I have ever had. Right behind me was the library’s section for books in the same age level as my own and yes I did borrow a lot of books from this section while I was there. At this event I expected to see a lot of new authors. Before coming I also expected to see an author I knew from the previous days event. What I didn’t expect was that I would actually know two authors there and that the only two I knew would be my neighbors. Closer to the end of the event I went around to the other authors tables. It should come to no surprise to anyone that I found a book I wanted to get. 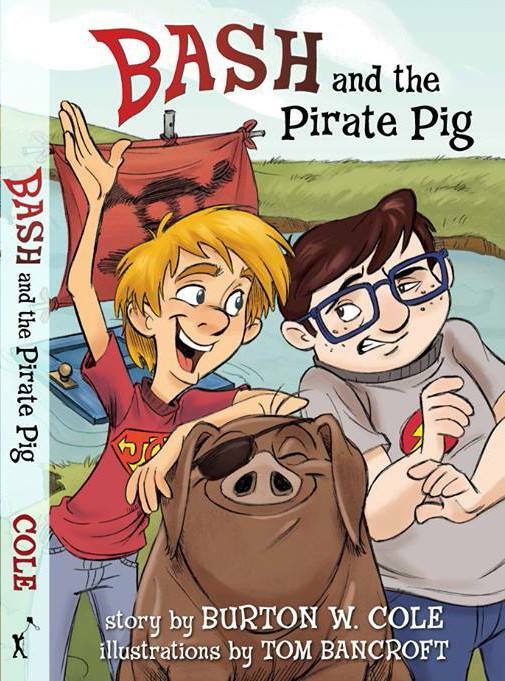 The book was Bash and the Pirate Pig by: Burton W. Cole. 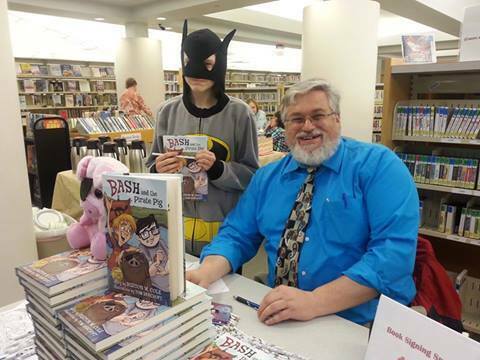 This one just features myself in my Batman hoodie with Burton and his book. This one features much of the same thing only I am not wearing the hood and Burton is holding one of the promotion cards for my Mortal Realm Witch series. So far I think this was one of the strangest things I have had happen at an event, but it was also fun. Burton is a fun author and if you get a chance I definitely suggest checking out at least his Facebook page. https://www.facebook.com/pages/Burton-W-Cole/136002170959. He really knows how to have fun with it. 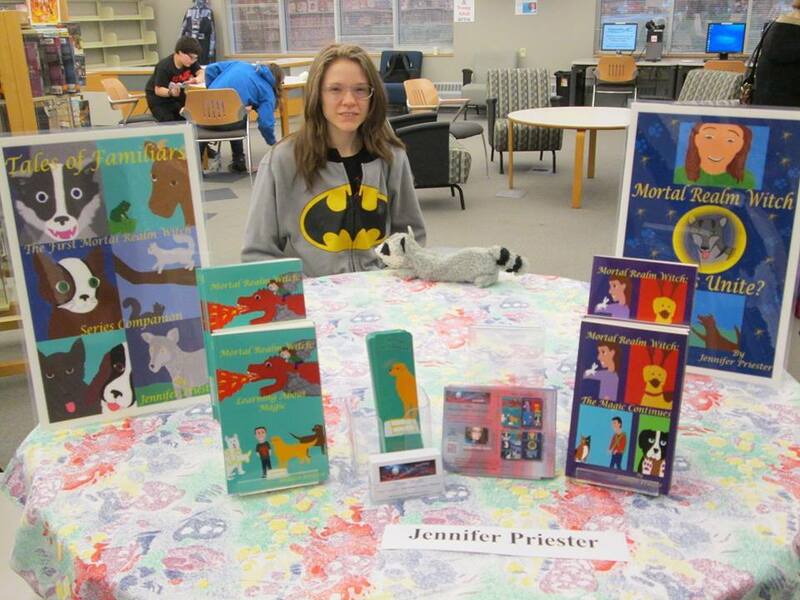 You can see more photos of myself on my Facebook pagehttps://www.facebook.com/pages/Jennifer-Priester/347205725374070. I recently created albums for 2012-2013 events and 2014 events. Today I also added an album for events that I am attending in the future, so if you live in Ohio, have Facebook, and are interested, be sure to check that out as well. 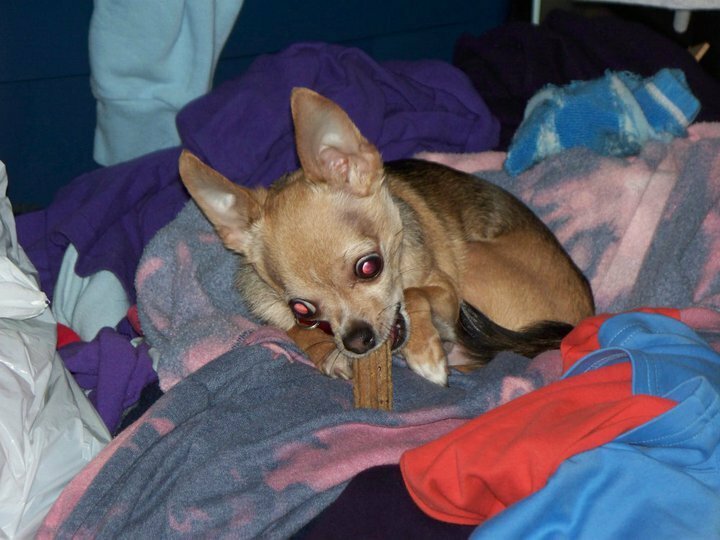 Many people give dogs hard treats to help their teeth. 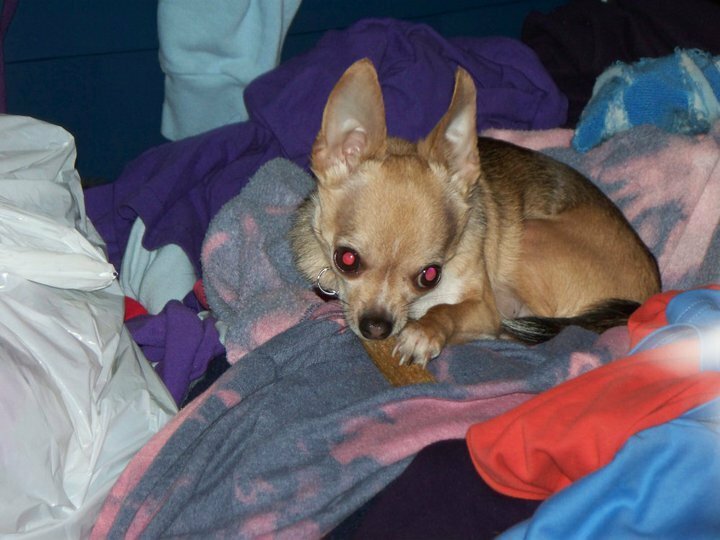 Once I did this with Taco until I discovered that my dog just isn’t like other dogs. 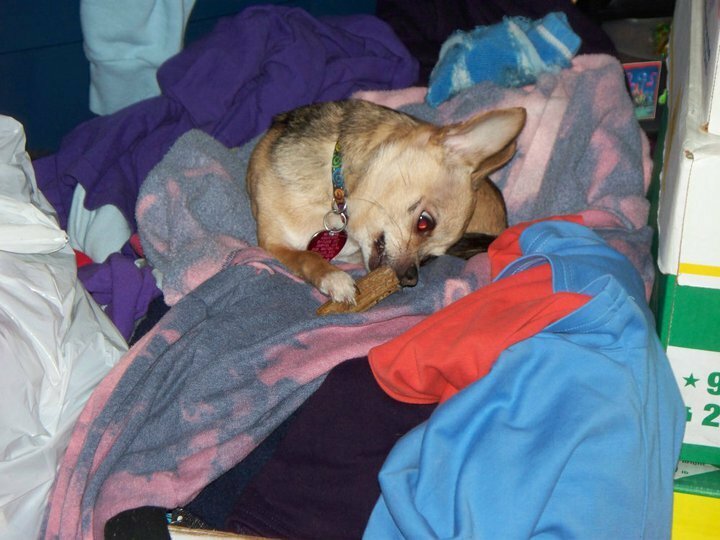 This is the picture story of the day I finally gave up giving him hard treats. 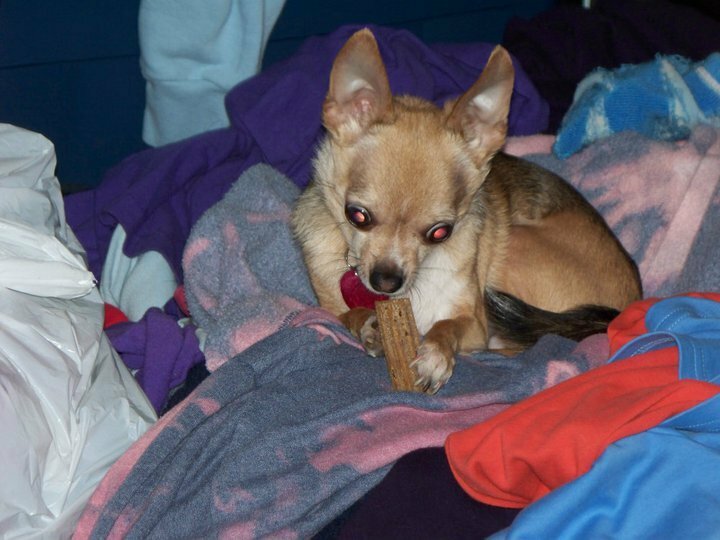 He does have and eats semi-hard treats, treats that are hard enough to minimally help his teeth but can be broken and chewed easily. While that is a good thing, it is not the story. So, without further delay, here is our story. First I gave Taco the treat and he spent a few moments observing it. Next he began chewing on it a little. 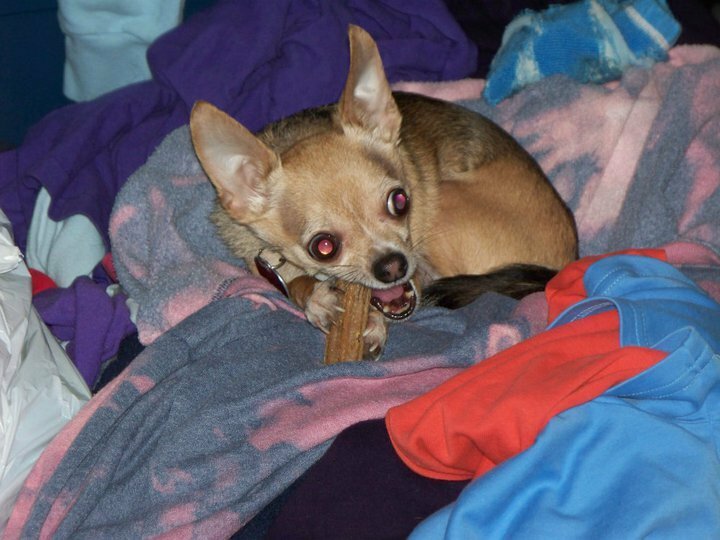 A few seconds later he switches to chewing it on the other side of his mouth. 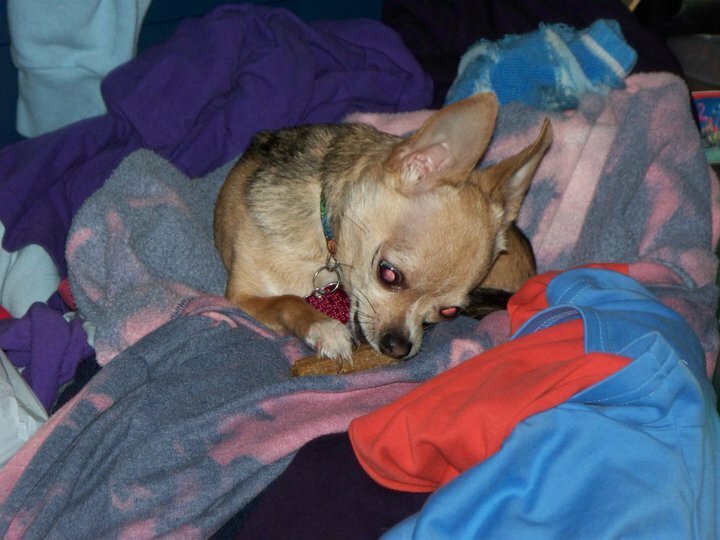 Then he quickly decides to return to chewing on the other side of his mouth again. He appeared to be enjoying the treat. A little while later he switches sides again. This is the side he normally chews food and treats on though he is now missing one of his back teeth so it’s become a bit hard for him to do. Taco now switches to using his front teeth and tongue in an attempt to get the treat softer. The mark by his eye is toothpaste that he hadn’t yet let me clean off. We often had toothpaste problems before I discovered the tiny toothbrush that I got from the vet, and can only find there, works best. Though I only learned this after buying and trying every small dog brush at the nearby petstores. We still make a mess with toothpaste sometimes but not nearly as much. Having failed to soften the treat in a short period of time, the no longer than five minutes in which this photo session took place, Taco puts down the treat. He then looks at me with the camera and wonders why I am taking pictures of him. Normally this next photo wouldn’t happen, but this time he decided to give the treat one more try. He had to try it on both sides again and once again he attempted to soften it for a few seconds. While he was softening the treat I grabbed a piece of dog food out of his bowl and placed it next to him to see what he would do. Curious of what I put there Taco almost immediately drops the treat to check it out. I thought he would go back to eating the treat but he didn’t. 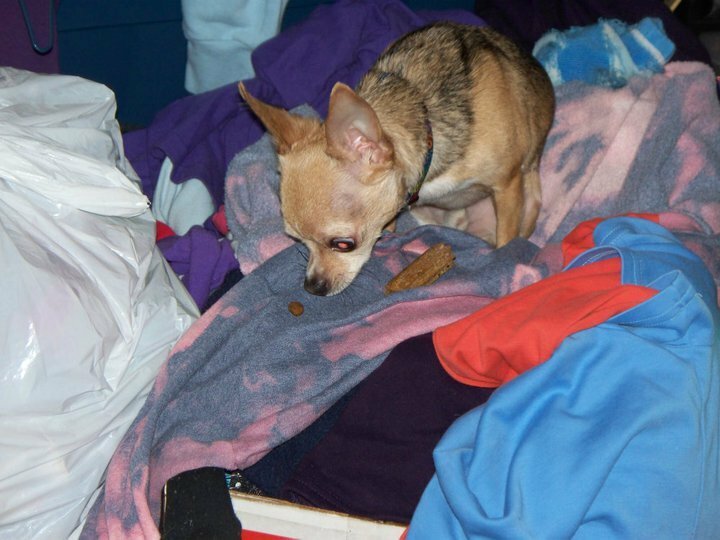 Instead Taco ate the regular dog food. This is the same dog who buries treats in his bed and other various locations to dig up and eat when he is hungry instead of eating his dog food, so for him to do this his regular food had to interest him more. The pictures end with the above image but what happened next is that Taco went over to his dog bowl to eat his food instead of the treat. 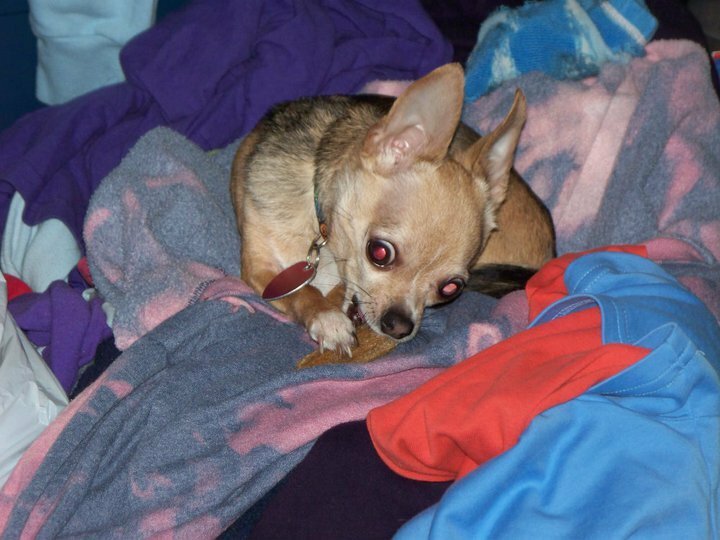 Neither that day or the rest of the week, in which I allowed the treat to remain where it was, did Taco ever return to it. I eventually got rid of the old treat and gave him a fresh which he simply ignored and eventually I had to get rid of that one as well. Having a whole bag of those treats I later found a friend with a dog who would actually eat the treats and gave them away. 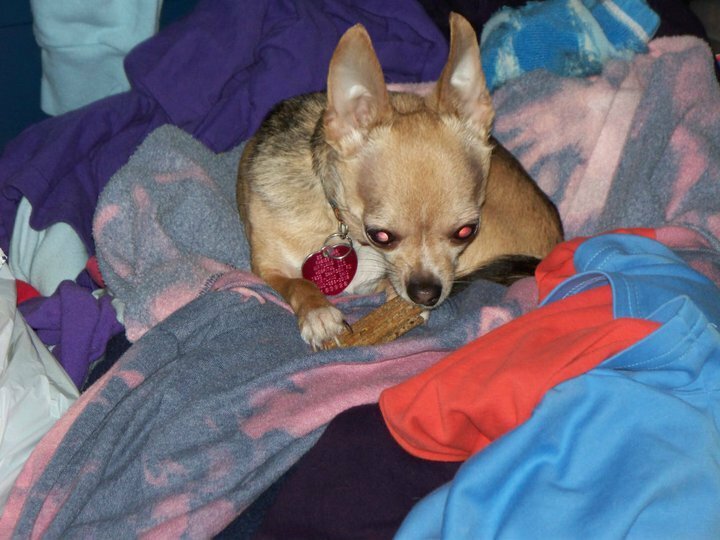 And that is when and why I eventually gave up giving my dog hard treats and just started brushing them more instead. I would eventually attempt to try dental spray with him, and still use it occasionally, where I would learn it’s easier to brush my dogs teeth than get him to open his mouth for the spray which he fights more than a bath. Taco is definitely not the average dog. of his section on the above mentioned website.